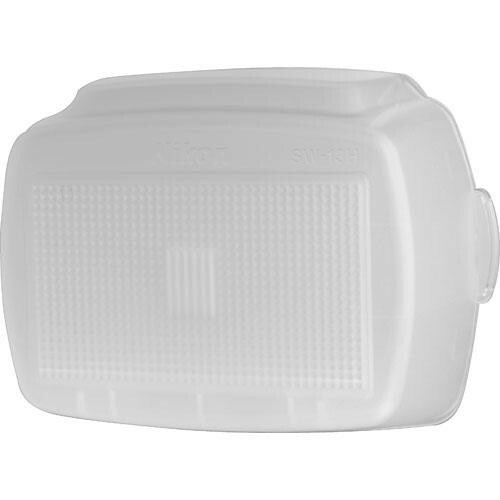 Box Dimensions (LxWxH) 3.5 x 3.4 x 1.8"
SW-13H Wide Angle Flash Adapter for SB-900 Flash is rated 4.9 out of 5 by 35. Rated 5 out of 5 by photoman from Great Speed Light Accessory I have ordered 3 replacements of these diffuser domes for my SB 900's - 1 got lost, 1 got broken, and 1 extra is now in my bag just in case. These Nikon diffusers work great for close diffused lighting and also when I secure 3 SB 900's to a Lasolite triFlash mount along with PocketWizard Flex tt5's for portrait work. Good way to soften light without having to carry along umbrellas or a mini soft box. A trick I have learned is to mount the diffuser up side down on the flash head. This can give you a little more punch as the flash head will still zoom instead of defaulting to wide angle. Although these diffusers work great, they are brittle and can shatter if you drop them on pavement. Rated 5 out of 5 by Anonymous from Can't go wrong with Nikon replacement Lost the diffusion dome that comes with the SB-900 and bought the Nikon replacement. To have a correctly shaped diffusion dome for the SB-900 is particularly important because Nikon designs the dome to be used in conjunction with it's gel holders, and pop-out diffusion panel. Good replacement, and hope I don't lose it again! Diffusers are not really to soften the light, they are to SPREAD it. Filling a room with flash is more easily done with this attachment, but I usually use it as another layer of diffusion behind an umbrella or inside a soft box. Rated 5 out of 5 by Matt from Perfect match for the orriginal unit I bought this to replace the diffuser that originally came with the Nikon SB-900. It is the same. I strongly considered a third-party version from Harbor Digital. I used a diffuser from them for years on an SB-800. The SB-900 and included diffuser seems overly-complex and is, for me at least, easy to mount upside down which disables certain automatic adjustments. I find it easiest to take a quick look at the Nikon logo on its front to check the orientation. Anyway, this is the right piece to replace the original SB-900 diffuser box. Rated 5 out of 5 by Epic Jamie from Keeping it simple As a professional wedding photographer, simplicity and portability are dire. These diffusers allow me to control my light in any situation. They do just enough. I have Gary Fong's and other more expensive accessories. But I always find myself keeping it simple and consistent with these. Rated 4 out of 5 by D1HD1XD2HD2X from Could be better Use it all the time for bounce, general softening of light, etc. It's a bit unwieldy compared to its predecessor (the dome for the SB-800). The only problem i've had with it (aside from losing it) is that the tabs on the side of the dome are not very sturdy -- i've already broken them in the rush of shooting. They also don't always side right in to the SB-900's slots. Otther than that complatin, it's a fine product. Rated 5 out of 5 by DukeFan from Exactly what I needed! This product was exactly what I needed and expected, and was delivered the day I expected it to. Since it is a Nikon part for a Nikon flash, it fit perfectly. There is nothing else to say. B&H has this online ordering business thing down pat. Rated 5 out of 5 by Lauren from Best Fit There are other flash adapters out there that are somewhat less money but this one is made to fit the SB-900 precisely and the others will not thus you will loose them. Spend the extra $5 and get a perfect fit. This Nikon SW-13H will fit the YONGNUO 685 for Nikon? Unfortunately, while I cannot test the above (and Nikon does not list compatibility with third-party flashes), I would say it is possible the Nikon SW-13H would fit the Yongnuo YN685 Wireless TTL Speedlite as the flash heads are similar in size. While I cannot guarantee it, I will state that Stofen makes their Sto-Fen OM-900 Omni-Bounce Diffuser, B&amp;H # STOM900, and they list on their website it is compatible for use with both the Nikon SB-900, SB-910, and Yongnuo YN685 Wireless TTL Speedlite. As there may be slight manufacturing differences and minute size differences between the items (and the Nikon SW-13H is specifically made for their flashes), I cannot give a 100% guarantee, but it is worth a shot as a good possibility. In either case, we do have a 30-Day Return Policy on the above item if you are not happy with it for your usage needs..
will this work with the SB-910 as well as the 900? Yes, the Nikon SW-13H will work with the SB-910 flash.